Taste of Grill from Brazil! 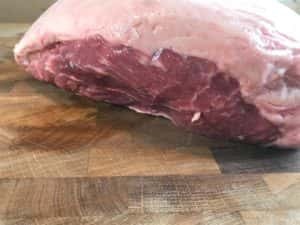 Picanha is triangular cut from the backside of the cow. It is also called Sirloin Cap or Rump Cap. It comes with a generous layer of fat, which adds flavor while grilling it. 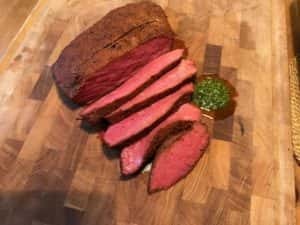 Picanha is always a great choice for grill and it can be cooked in many ways. Some pitmasters like to carve it in 1” slices, some grill it as a whole. Whole cut can be grilled reverse sear, or it can be sliced and grilled as steaks. Skewers and rotisserie make a great scene if you have audience. Any way you might choose, it is very easy to succeed with. My choice today was to smoke it as a whole. 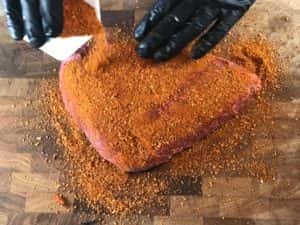 When smoking Picanha, fat layer is not needed. Cooking temperature will be at 245°F (120°C) and target doneness is medium rare, 133°F (57°C), thus cooking time 1 – 2 hrs. This means fat does not have enough time to dissolve. In fact, fat layer is so thick it will only get chewy and rubber like. So, it goes away. I rubbed my Picanha well on all sides 1hr prior cooking. Then ignited charcoals in my Monolith Kamado and let it heat up to 245°F. Heat deflector was half covering charcoals and I was aiming at reverse sear method. I placed the Picanha on top of the grill grate and put thermo probes in. One into the beef and another on grill grate monitoring ambient temp. Two chunks of apple wood were on top of hot charcoal for smoke generation. 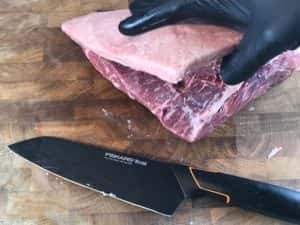 It took one hour of smoking for beef to reach inner temp of 120°F (49°C). I took Picanha out from the grill, opened all vents and let the kamado heat up to 390°F (200°C). Then I seared Picanha all sides quickly over the hot side of the grill. Once seared, I wrapped the beef in foil to rest for 30min. The heat carries over few degrees while resting. End result was wonderful 133°F, medium rare doneness. In Brazil, Picanha is served with chimichurri. Completes the great ”Churrasco”! Dry aged and dry brined. How can it be juicy?